Superior Signal Company is proud to announce the latest version of our popular VPE-GN "GooseNeck" Ultrasonic Leak Detector. Featuring ALL-NEW internal circuitry, the improved AccuTrak® VPE-GN stands out above all other ultrasonic instruments in its class. With even greater sensitivity and a number of new features unique to the VPE-GN, no competitive ultrasonic leak detectors even come close. 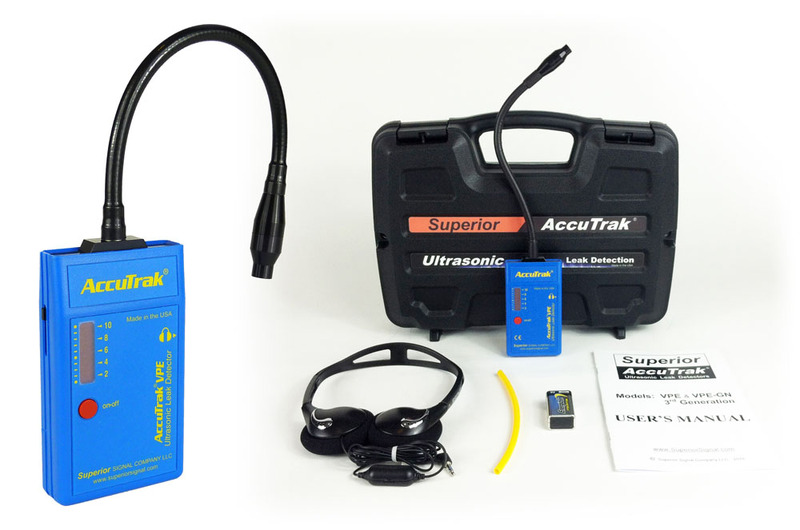 The Patented Superior AccuTrak® VPE-GN “Gooseneck” Ultrasonic Leak Detector is a state-of-the-art non-invasive ultrasonic leak detector that can detect both pressure and vacuum leaks of ANY GAS. 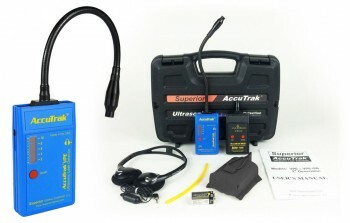 The AccuTrak® VPE-GN is ideal for pinpointing leaks in air conditioning, refrigeration, automotive and other systems. The new 9½” flexible Gooseneck provides better detection capabilities in hard-to-reach places. AccuTrak® Ultrasonic Leak Detectors are extremely sensitive to the ultrasonic sound of a turbulent gas leak. Using the latest "heterodyning" technology they translate ultrasound to a lower frequency which your ear can interpret. The VPE-GN Ultrasonic Leak Detector maintains the original sound characteristics making it possible to distinguish leaks from other competing background sounds. AccuTrak® Instruments are so sensitive you can actually hear the blink of an eye, yet most background noise will not interfere with detection accuracy. Like all Superior AccuTrak® Leak Detectors, the VPE-GN easily detects leaks of ANY gas or refrigerant, compressed air, and even vacuum leaks. Gas Leak Detection: Air, Refrigerant, Vacuum, ANY GAS! Gooseneck Configuration: allows operator to get accurate readings in hard to reach places. Audio Output: 0 Hz to 4 kHz Natural Sound conversion allows you to Hear the Leak, and distinguish leaks from mechanical or other background ultrasound. Visual Output: 10 element bar graph provides quick and intuitive visual indication to presence of and relative strength of ultrasound. Adjustable Sensitivity: allows operator to quickly identify leaks from a distance, and then zero in on the exact location of the leak. Capable of detecting a 5 psi leak out of a 0.005" (5/1000 inch) hole, 20 to 30 feet away depending on background noise. Easily detects any gas that generates ultrasonic sound during flow – including vacuum leaks. Capable of detecting leaks equivalent to 1.5 oz/year of Refrigerant. Works equally well for compressed Air or Nitrogen. Not affected by wind or high concentrations of leaked gas or refrigerant. Whether you only need the basic functions of the VPE-GN or you plan to take full advantage of the instrument's diverse capabilities, we have a kit that will meet your needs! Click the "Find Your Kit" tab above to learn more. 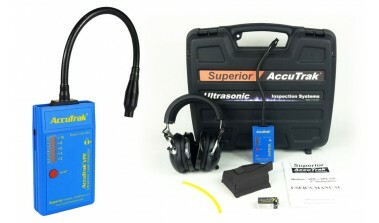 AccuTrak® VPE-GN is a much more accurate and reliable instrument for detecting single and multiple leaks. AccuTrak® VPE-GN can detect any type of refrigerant gas including nitrogen. AccuTrak® VPE-GN detects both vacuum and pressure leaks. AccuTrak® VPE-GN is effective in gas saturated areas and under windy conditions. AccuTrak® VPE-GN does not require the introduction of tracer gases into the system, which can be ozone depleting when vented, and can also be harmful to ones health. AccuTrak® VPE-GN is #1 in technology. We wrote the book on ultrasonic leak detection, our patented instruments lead the industry! AccuTrak® VPE-GN is the original! it is not a copy. AccuTrak® VPE-GN is the most durable unit available, with the best warranty. The face of the unit is sealed with no pin holes/speakers for foreign objects to enter. AccuTrak® VPE-GN has more dynamic range, and wont overload in loud areas. AccuTrak® VPE-GN gives true audio sound reproduction instead of the "beeps and squeals" of other instruments. "I visited your booth at the Las Vegas show and bought your product. I must commend your company for delivering a great product. 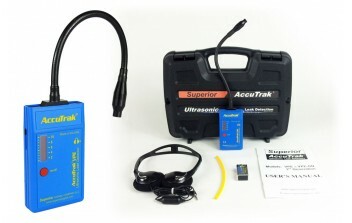 I used the AccuTrak for the first time last week looking for a leak in a walk in box with evaps 12 feet in the air. While looking for a leak in 2 of the 4 coils, I passed a coil that I wasn't even looking for a leak in. From the ground I heard a slight hiss and upon closer inspection I found a leak at a TXV so small my bubbles did not even show it. I did wind up finding the original leak I was looking for too. I have never had the opportunity to write such a great review for a HVAC product in my 25 years in the industry. I want to say thank you and keep up the great work. I'll be looking at your upcoming products with anticipation." Superior AccuTrak® advanced patented technology has never been so versatile! The AccuTrak® VPE-GN Standard Kit offers all the functionality and features of the VPE Basic Kit – but with the sensor on the end of a 9-1/2” long flexible GooseNeck to get into all those hard-to-reach places. The VPE-GN Standard Kit is great for technicians in the Automotive industry, or any others who need to find tough leaks or other airborne ultrasound in tight spaces, behind obstructions, or inside an assembly. As with all AccuTrak® instruments, the VPE-GN finds leaks for any kind of gas or refrigerant without changing tips or components. Works equally well to find compressed air leaks, nitrogen leaks – even vacuum leaks! AccuTrak® can find leaks as small as the equivalent of 1.5 oz per year of refrigerant, or can hear a 5 psi leak up to 30 feet away. 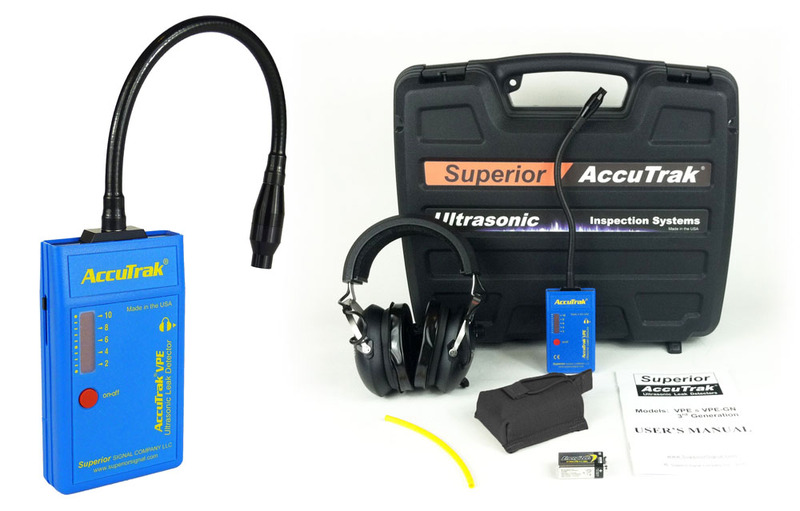 The AccuTrak® VPE-GN Professional Kit is designed for technicians who work in noisy places, or who regularly need to find smaller leaks. With the sensor at the end of the 9-1/2” long flexible GooseNeck you get full sensitivity all the way into those hard-to-reach places. The VPE-GN Professional Kit includes all the great features of our VPE-GN Standard Kit upgraded with professional Noise Cancelling Headphones, a convenient Belt Pack, and a larger case to keep everything together. These high quality headphones eliminate all background noise, allowing a technician to effectively find the smallest leaks – even in very loud environments. You can choose the standard style professional headphones, or the hardhat compatible version – same price! The AccuTrak® VPE-GN Plus Kit is designed for technicians looking to take full advantage of all the VPE-GN’s many capabilities. The VPE-GN Plus Kit includes everything in our Standard Kit – PLUS a convenient Belt Pack and our powerful Burst Tone Sound Generator! The sophisticated Burst Tone can artificially pressurize any vessel or space with ultrasonic sound, allowing a technician to quickly scan for leaks even where there is no actual pressure differential! The VPE-GN Plus Kit is ideal for technicians who test refrigerator door and window seals, or any other non-pressurized seal or vessel. The VPE-GN Plus Kit is also great for Energy Audits and Surveys, and finding air leaks and sources of air infiltration in homes, aircraft, ships, and buildings. The AccuTrak® VPE-GN Pro-Plus Kit is our most comprehensive VPE-GN Kit, for the serious technician who needs the maximum capability from an ultrasonic instrument with a GooseNeck. The VPE-GN Pro-Plus Kit includes the upgraded professional Noise Cancelling Headphones, a convenient Belt Pack, PLUS the powerful Burst Tone Sound Generator, in the larger case to keep everything together. The VPE-GN Pro-Plus Kit offers unrivaled functionality and versatility for a fraction of the cost of any competitive system with similar performance. Find any kind of leak, in any environment, find bad gaskets and door seals – and do it all well, in hard-to-reach places you can’t even see! If you do a variety of work, and need a cost effective professional kit that can do it all, the Superior AccuTrak® VPE-GN Pro-Plus Kit is for you. 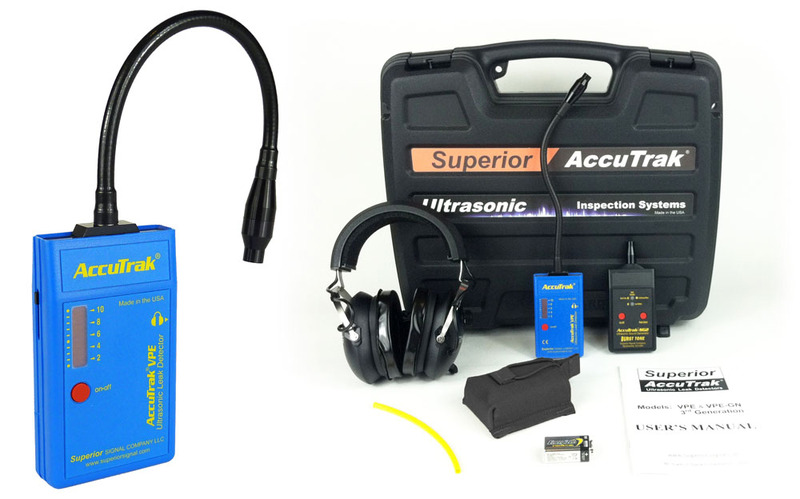 AccuTrak® Ultrasonic Leak Detectors offer patented technology, innovative features, superb customer service, and all at an exceptional value. AccuTrak® products are designed, made, and serviced in the USA, and built to provide many years of service.